We’d love your help. Let us know what’s wrong with this preview of Goddess Born by Kari Edgren. To ask other readers questions about Goddess Born, please sign up. To say that this book surprised me is an understatement. I love this book so so much! I was so sad when I have to read the end.. WHEN IS THE SECOND BOOK COMING OUT??! The story? The pacing was good! The whole idea of the story is new to me and I was enchanted and enthralled. Though I didn't get enough of Selah's Otherworld, I'm hoping that that will happen in the second book. The Romance? Not cliché at all. But I was really conflicted the whole time. Selah and Henry played with my emotion through out the book, but I was really satisfied by how the author woven their story. Their relationship is so... passionate. And I just found out that this was a debut novel, well, Wow! For a debut novel, this is amazing! I didn't like the writing at first but It was so compelling. It's one of the reasons why I kept reading. And I guess this is the sad part. The waiting. I want to get a hand in thr sequel now. Like really, my heart is ready. GIVE IT TO MEEE! All in all, Goddess Born is one enchanting read you don't want to miss! And Kari Edgren is an author to watch out for!! Quirky and original, with a very clever plot. This book is humorous, and packed with human insight. Granted, it's a Romance novel, but truly the label's stereotype fails as description. I loved the romantic tension, the inclusion of Celtic lore, the intense, but lovable main protagonist, and her loyal 'love-interest' and self-styled protector. There were so many good things in this book that it's difficult to give an overall impression of its merits other than to say that the writing "moved" me, Quirky and original, with a very clever plot. This book is humorous, and packed with human insight. Granted, it's a Romance novel, but truly the label's stereotype fails as description. I loved the romantic tension, the inclusion of Celtic lore, the intense, but lovable main protagonist, and her loyal 'love-interest' and self-styled protector. There were so many good things in this book that it's difficult to give an overall impression of its merits other than to say that the writing "moved" me, engaged me, and left me with a sense of a story well told. The setting, in its historical cloak, is both interesting and rich; rich in the sense that we are given a glimpse of not only the American realism of religious fanaticism of the time, but also of the indigenous American population's struggle with progress, as well as the banditry for which the period is famous. Our villain, the righteous, reverend is atypical in his eventual fate, and central to the "knotting-off", of any loose ends left by the smart, sharp plotting. The imagination necessary to envision a creation of this magnitude, is an accomplishment in itself. This is a vivid telling of a girl, whose other-worldly healing-powers land her in a hostile situation: with only her wits and her new-found companion to protect her. A truly remarkable fiction, well worth the time. Having in view the closeness in time and space of the events, 1730 Pennsylvania and 1693 Massachusetts, and also the subject of Goddess Born, it is impossible to not connect the story‘s events with what remained in the American history, and in the universal one too, as the „most notorious cases of mass hysteria”: the Salem witch trial. In fact, it is imperative that such a connection shall be made. That's because the heroine’s fear - of death- , of being accused of witchcraft and her desperation Having in view the closeness in time and space of the events, 1730 Pennsylvania and 1693 Massachusetts, and also the subject of Goddess Born, it is impossible to not connect the story‘s events with what remained in the American history, and in the universal one too, as the „most notorious cases of mass hysteria”: the Salem witch trial. In fact, it is imperative that such a connection shall be made. That's because the heroine’s fear - of death- , of being accused of witchcraft and her desperation to find a haven (next to the "fragility" of the women social position in that era) is what ignites and feeds the events of the story. In a time of great despair, Selah – the heroine from Goddess Born, will make decisions that will be considered ideal at the time. When everything seems to be ruined, when it seemed that there was no future for her, the chance comes with a stranger even if not in the best moment of his life himself. But the chance is one with two faces: the possible happy ending of the contraption that Selah brews can be replaced at any time with the more probable disastrous finale that could lead not only to her dishonor and loss of the welfare state, but even to the incarceration or death of those involved. Slowly, but surely, the social drama gives place to a romance impossible to fulfill, reaching to closely intertwine with it and to influence each other. The social reactions are manipulated by the main characters, Selah and Henry, but the secrets that each of them conceal threaten the very success of their plan. The paranormal side of the story is present from the beginning, being kept somehow hidden through veils, without being pushed in the eyes of the reader, but not less generating, directing motivations and reactions. The author offers the possibility of developing several ways of the story keeping you curious about what will be her choice and whether the fantasy element will belong to other characters too. The main characters evolve, you will feel them and love them. The story being told in the first person, by the heroine, you will always know her thoughts and fears, but the author will take care to show you also Henry's intentions even if in the roller coaster of events, Selah will misinterpret them. Various types of human natures, religious fanaticism and naivety, ignoble interests and desires for vengeance, but also kindness, loyalty and a deeper understanding of the world from some of the characters will intervene and provide confrontations and attacks, lethal dangers and miraculous salvations, but also unexpected twists in a story whose pace is kept alert, the rarest slower moments existing only to point the suffering brought by an impossible love. Goddess Born denouement seems to solve some of the problems, but will also bring other issues whose resolutions will have to make the subject of another book, a story that will take place at an entirely different level. I cannot wait to read it. Exceeded my expectations in every way! Loved it and can't wait for the sequel! Now, keeping that in mind, Kari Edgren’s novel “Goddess Born” (if written as non-fiction, obviously) would be the perfect example of what happens when the “inability to understand something” shakes hands with “religious fanaticism.” (AKA: total chaos.) And despite its home being built on a gothic paranormal frame, (the protagonist IS the offspring of a deity after all) it’s ability to stand firm in it’s depiction of the era was impressive. Arranged marriages, unforeseen illness, Indians,…witch-hunts, they were all present and accounted for. They also combined to make a fairly interesting story that I feel obliged to label as: Historical Romance – With A Kick. But when news of Samuel’s death reaches the Colonies, Selah is truly on her own. Terrified, she faces an impossible choice—forfeit her powers and marry the loathsome Nathan? Or find an impostor to pose as her husband and preserve her birthright?" To which I say…you are right. It does. But that’s NOT how the book reads. As a matter of fact, the “goddess” aspect of the story is almost secondary to, well, everything else. Yes, she has a supernatural ability to heal people. This simple fact is thrown in the readers face right out of the gate in regards to both her father and her betrothed. And yes, her powers are used again and again when people around her are dropping like flies. (Wow, that sounded very dis-compassionate. Hmmm, is that a word? Oh well.) BUT, the discussion of WHO she is, WHY she has these powers, WHAT the pros and cons of possessing this particular power encompass are almost an afterthought. Skimmed over and thrown in for continuity purposes. Is this a bad thing? Not necessarily. The gusto of “Goddess Born” lay in the relationships surrounding Selah and how they contributed to both her romantic endeavors as well as her ability to survive being hunted for her differences. Take Samuel for example. He is dead before he is even introduced as a character, but his death spawns the ENTIRE web of treachery, deceit, and love that make up the story behind GB. Without his death there would be no need to lie for freedom. Nathan would have no ground to stand on. Would there even BE a witch-trial? Or an angry merchant set on revenge? Probably not. There would be no “love-match” because Selah would have been trapped in an arranged marriage. Speaking of her “love-match” (who will remain nameless because I don’t want to spoil the story) it is spine-tingling. From forced kisses, to imprisonment, each and every move and countermove made by the couple make up one hell of a bewitching (no-pun intended) romance. Nathan, the Quaker Elders, even a random magistrate…they all play interracial parts. Each character has a purpose, and each purposes in peeled back one layer at a time exposing (in the end) a rather shocking “who-dun-it” mystery. So yes, this is a story about a woman with extraordinary powers, but that’s not all. It’s a story about how far people are willing to go when they feel threatened, alone, rejected. How perception can change with one simple suggestion. How faith in people is sometimes necessary to survival. AND…it’s about how love IS a battlefield. If you are a fan of paranormal fiction, historical romance, or… say…books like Outlander, chances are you’ll enjoy this. Happy Reading my fellow Kindle-ites and remember: Not understanding something doesn’t make it evil. It’s been a while since I’ve been easily sucked into a historical setting novel, but the magic, romance and intense pace had me hooked right from the start. This was Edgren’s debut novel and I’m so hoping the first in a series. Goddess Born follows Selah Kilbrid who lives in a small Quaker community in 1730 Pennsylvania. She has been living with a secret that has been in her family for many generation, she is a direct descendent of the Goddess Brigid. She is the healer in her community, but no one knows that she can actual heal wounds and sickness with her gift. But everything changes after the threat of a horrible minister, who says she must marry him or he’ll accuse her of witchcraft. Luckily her second cousin is coming to marry her, per her dying fathers request. She sadly learns of her cousin death on his voyage to her, making Selah desperate enough to have a servant, named Henry, pose as her husband and late cousin. Together they keep their secret until Henry can back off the horrible Nathan and protect Selah from being accused. But someone is trying to expose her and she fears that Henry with leave her too if he finds out the truth. Selah is a fiery but sweet young woman, who has only done what any healer would do…help people. She has been a healer since her mothers passing, but is now worried she may be forced to marry a hateful man. Her journey takes her in many directions; she isn’t sure what her fate may be with the distraction of Henry and her attraction towards him. Plus her gift may be revealed to a community who might not be as accepting. I loved the idea of her heritage, I’m not familiar with Celtic myths but it fascinated me to see how great her power was. It was also interesting to see how someone during that time dealt with being accused; it was a serious offense then. My only issue was that if she was being accused, she shouldn’t of been wandering obviously into the wood so much, or at least tell Henry. I would have been super careful not to get caught. Henry is a mystery at the beginning; it was obvious of the attraction between him and Selah. He was a strong and very intelligent person, who has a knack for protecting his new “wife”. I liked how he just fit with Selah, that their relationship was sweet and paced nicely without being forceful. I also adored him more because of how he handled the evil Nathan who is trying so hard to blackmail Selah. But Henry chewed him out nicely. In the end I was super surprised about Henry’s background and am hoping for a continuation story about what this major secret with reveal. Overall this was a fantastically written debut, characters were strongly developed, as well as the plot was perfectly paced and full of twists that caught me by surprise. The best part beside the cute and clean romance were the villains; I was always guessing and so shocked about who the culprit was. I look forward to more writing from Edgren and hoping that she continues this series. This is a young adult novel, with mystery, fantasy and clean romance all bundled together. 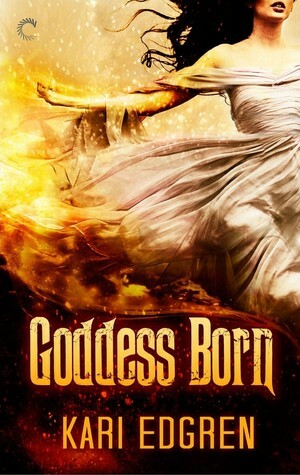 Fans of The Sweet Trilogy by Wendy Higgins and the Covenant series by Jennifer Armentrout will love Goddess born by Kari Edgren. *This is an NA book, but is clean and may be read by all ages. This review makes me happy! I'd stopped taking review requests, but when the opportunity came giving me the opportunity to review Goddess Born, I jumped on it. As one of the only NA fantasy books I've read, I'm enthralled. Plus, there is the concept of Brigid, a Celtic goddess, and we all know how much I enjoy this type of mythology. Selah's story takes place in 1730, when any woman who appeared a bit odd was considered a witch. Selah *This is an NA book, but is clean and may be read by all ages. Selah's story takes place in 1730, when any woman who appeared a bit odd was considered a witch. Selah happens to be different, in many ways. Her refusal to marry one man sets off a chain of events, risking not only her reputation, but her life as well. Once her father dies, there's little to protect Selah from the rumors she is a witch, especially when her husband-to-be dies at sea. Luckily, this young woman is quick on her feet and stumbles upon a plan that may save her life. Ms. Edgren serves a delicious helping of fantasy intermingled with a helping of endearing romance. The characters leap off the pages, becoming three dimensional people you'll either love or despise. Selah is a caring girl who is devoted to her community. Her gift in healing has earned her many loyal friends who will stand by her no matter what adversity she faces. Nathan is a nasty, jealous man who's been fed lies enabling him the ability to blackmail Miss Kilbrid. His interest in the beautiful young lady becomes dangerous when she doesn't return his affections. The list of people who could be passing Nathan Selah's secrets appears to be small, yet becomes greater with every flip of the page. And then there's Henry, who I loved with all my heart. He plays his part well, protecting a young woman he's known for only a few days. I don't want to discuss him too much because he's the heart of this story, even when you're not certain whether you like him or not. His character provides plenty of warm, fuzzy feelings as well as a bit of drama from time to time. The twists and turns in Goddess Born are delightful. I never knew who to suspect and was adequately shocked when the true culprit is revealed. Ms. Edgren blended all the intricacies of suspense with those of fantasy and romance. The writing is flawless and creative, evolving into a perfect novel. There's a lot to love about this book!! First of all, the cover! Then we have a marriage of convenience, historical setting, mythology, villain, hero, romance, humor, mystery and suspense. Selah needs to marry her cousin, Samuel, so she can keep her healing secret safe and not have to marry Nathan. We get a taste early on of the way Nathan treats her and why she's so desperate to do whatever she has to do to stay away from him. When she gets to Philadelphia, she's stunned to learn that Samuel ha There's a lot to love about this book!! First of all, the cover! Then we have a marriage of convenience, historical setting, mythology, villain, hero, romance, humor, mystery and suspense. Selah needs to marry her cousin, Samuel, so she can keep her healing secret safe and not have to marry Nathan. We get a taste early on of the way Nathan treats her and why she's so desperate to do whatever she has to do to stay away from him. When she gets to Philadelphia, she's stunned to learn that Samuel has died, so when she sees the line of indentured servants being auctioned off, a plan starts to form. She saves Henry from a situation he doesn't want and as she gets to know him, realizes there's more to him than she originally thought. Thanks to I Am A Reader, Not A Writer and Kari Edgren for letting me read this early for the review. I was given a copy of the book in exchange for an honest review. The cover is super awesome, I dig the colors and I like how they remind me of Brighid's Fire, which is the entire way that Selah can heal someone. I really like this book, it was interesting and I really like how everything was paced out nicely. There was some mystery and the ending threw me. I definitely didn't think that the bad guy Thanks to I Am A Reader, Not A Writer and Kari Edgren for letting me read this early for the review. I was given a copy of the book in exchange for an honest review. I really like this book, it was interesting and I really like how everything was paced out nicely. There was some mystery and the ending threw me. I definitely didn't think that the bad guy was who he actually was. It was sort of a Scooby-Doo moment when the mask comes off and you didn't see that coming. I also really like the relationship that Henry and Selah have. They don't rush into things too quickly, they both have their secrets and the way their relationship starts off is reason enough to keep your secrets from a complete stranger. Nathan made me want to strangle him, and I was sort of ticked off when he was saved at the end. I think Selah would have been better off to leave him, but knowing that he needed help she couldn't turn him away, a part of being Goddess Born - when someone asks for help she HAS to give it to them, or else she'd be cursed. On goodreads this doesn't say it's part of a series, but I'm pretty sure we'll be seeing more. The book ends on a romantic cliffhanger, and I GUESS it could end where it did, but I highly doubt that it will. Henry is leaving for England and Selah is in tow, and I'm pretty sure we're going to need to find out what happens in England. I do! A gifted healer, the blood of a Celtic goddess running through her veins enables Selah Kilbrid's talent. A talent that needs to be renewed by prayer and in secret. Persecution is a heartbeat away. Hopewell, Pennsylvania 1730 and Selah is being pursued by the Quaker minister, Nathan Crowley. His regard for her turns sour when she refuses his suite. Despite knowing Selah is engaged to her cousin who's on his way from Ireland, Nathan threatens to expose her as a witch if she doesn't m ...unexpected! Hopewell, Pennsylvania 1730 and Selah is being pursued by the Quaker minister, Nathan Crowley. His regard for her turns sour when she refuses his suite. Despite knowing Selah is engaged to her cousin who's on his way from Ireland, Nathan threatens to expose her as a witch if she doesn't marry him. Her family, although Catholic had settled here in the New World to escape persecution of their kind in Ireland. Selah's mother and grandmother had the 'gift'. They had been accepted into the Quaker community, and attended meetings but had retained their own religion. Now Nathan was endangering that acceptance and Selah's life. Plotting to outwit him Selah flees to meet her fiance's ship. To her dismay she discovers that he perished on the voyage. In desperation she outbids bids a wealthy brick works' owner for an indentured servant, making a new enemy. Her plan is to wed the fellow, present him as her cousin and new husband, in name only. After a suitable time she'd free him, send him away and she would maintain her independence. Just as there is more to Selah, we discover there is much more to Henry. Certainly the tempo picks up as he becomes more involved in Selah and her predicament. With a fascinating story line, a determined and likeable main character, Goddess Born held my interest from woe to go. I read it in one sitting. I was looking for a change, needing a reset after reading so many contemporary romances lately. When the opportunity to read Goddess Born by Kari Edgren came across my email, I jumped at the chance. I happy to say I was pleasantly surprised. This suspenseful book was exactly what I needed, accusations of being a witch aren't taken lightly in 1730 Pennsylvania after all. Selah, our female protagonist, is a direct descendant of a Celtic goddess. Selah finds herself in quite the predicament. Her father is ailing, she's set to marry her cousin from Ireland in order to order to preserve her secret, the Quaker minister in her town wants to marry her oh and she's essentially alone in the colonies having no relatives in the New World. When her father passes, she's in Philadelphia anxiously awaiting the arrival of her cousin only to find that he's passed away during his travels. Poor Selah is left to make some difficult decisions. In Selah's haste to marry she convinced Henry Alan, an indentured servant to marry her. And thus the story sets forth. There was an awful lot going on in this book and I have to be honest, I had no clue what was really afoot. The author does a great job of leading us in one direction only to completely turn us around and send us another way. There were many things I liked about Goddess Born, I think the suspenseful nature of the story took the lead though. I had a feeling that some of her problems from Philadelphia would ultimately make their way to Hopewell. I did not however, see some of the other obstacles. And just when I thought I'd figured out which servant was gossiping about, another would act suspicious and I would change my mind. Turns out I was wrong in the end lol. Henry isn't totally innocent either and he remains somewhat mysterious for the majority of the book. I would have liked to seen more of a relationship develop between Selah and Henry however, the story itself doesn't really allow for that and it's understandable. I think perhaps the real romance between these two will come forward in the next book. The ending of this story does lead you to believe there is another book coming. I definitely appreciated the subtle tone the author took with addressing how people from different backgrounds could fall in love. Religion was a major player in the lives of people back then. Selah refers to herself as half catholic. She's living in a Quaker community and married to Henry who appears to be loyal to the Church of England. Needless to say there are many obstacles these two will need to overcome if they're going to get their happily ever after. There were many times I was frustrated with Selah's character and when I thought I couldn't handle anymore, she would do something that erased my misgivings. It's hard to explain but as times I was confused by her lack of expressing her emotions, yet several pages later she would finally break down. I waited for those times, so that I could connect to her character. She was alone and I understood her need to be independent and strong. I also appreciated her ability to accept her wrongdoings and make them right. She had a difficult time being deceitful and I found that her character was inherently good which makes her more endearing. You'll love her character as a result and you'll be rooting for her in the end. Although Goddess Born had a bit of a slow start for me, I quickly became enveloped in the plot. I was eager to finish so I could find out how Selah would fair with supernatural abilities in a Quaker community. I honestly can't wait to see where the story goes from here. Obviously I'm rooting for a happy ending for Selah and Henry. From the blurb, I had pretty high expectations about Goddess Born. Not only that, it came highly recommended to me from a friend/colleague! So you could say Kari Edgren’s book had a lot to live up to. As it turns out, Goddess Born would far exceed my high expectations. The characters were excellent, the world-building was fantastic and Kari Edgren brought the early Colonies to life. First off, the characters were excellent. Selah in reality, had a horrible decision to make when she learned of her cousin’s death. Her father is dead so there’s no man to protect her from the law and Nathan’s wrath. Her only hope is to marry her cousin, who’s dead. But nobody in Hopewell knows that, do they? So she embarks on a long, arduous and sometimes funny journey when she marries Henry, an indentured servant set to play the role of her cousin. I don’t think it’s a spoiler to say that yes, of course Henry and Selah are going to develop feelings for each other, but I also have to say that those feelings were far from Insta-Love. In fact, it was almost Insta-Hate for a while there. Both Selah and Henry stand out for me as characters. They both have complicated histories behind the circumstances that found them married and neither one is really keen to divulge their past to the other. At the same time, it’s obvious that both of them feel for the other’s plight. Selah doesn’t like forcing Henry into a marriage just to save her own skin and Henry doesn’t like the fact that he’s the only one standing between Selah and Nathan’s considerable wrath. He feels for Selah and she for him, but of course things are always more complicated than that. As for the magic of Selah’s line, I think it was pretty well thought out. It comes from the Celtic goddess Brigid and puts a lot of strain on its possessors. They have the power of life and death over medical matters, so you really have to appreciate the fact that Selah is a good person who would never hurt anyone, even her own worst enemy. Power like that can become heady and change people, but Selah is the sweet and level-headed young woman that she always has been. What I really liked about the fact of Selah’s power is that she does run out and she does have to do a complicated ritual to renew it by going to the Otherworld. Maintaining her power is not easy and adds another layer of conflict, rather than like in most stories where the power is never-ending and/or naturally replenishes itself. I have to say that I also loved both the descriptions of the time as well as the pacing of the plot. Kari Edgren really made me feel like I was in Pennsylvania in 1730, even though obviously I haven’t and I’ve never even studied that period of history. I can’t vouch for authenticity in her descriptions but I do know that her writing really makes you feel like you’re in the period. Sometimes that’s almost better than being accurate and boring. The pacing, however, doesn’t allow for boredom. It starts out a little slow at first, but quickly we have Selah’s life spiraling out of control as Nathan makes his ultimatum, her father dies, she learns her cousin dies and she marries an indentured servant to pose as him. There is no such thing as a boring moment in Goddess Born. So, at the end of all this, I don’t have anything but praise for this book. It came highly recommended and exceeded my expectations. It was fast-paced, felt historically authentic and the characters were amazing. I can’t recommend it enough and even if you’re not necessarily a big reader of historical fiction, I’m pretty sure you’ll like it. This book has one of the most unique premises I've read in a while: set in 1730 in the Pennsylvania colony, our heroine Selah Kilbrid is literally a direct descendent of the goddess Brigid. Her divine gift is that of healing, a gift she cannot refuse to use when asked -- but a gift she has to keep hidden lest she gain some unwanted attention. From an Irish Catholic family, she lives in the heavily Quaker town of Hopewell, a well-liked healer and farmer's daughter. Pursued by a Quaker preacher, N This book has one of the most unique premises I've read in a while: set in 1730 in the Pennsylvania colony, our heroine Selah Kilbrid is literally a direct descendent of the goddess Brigid. Her divine gift is that of healing, a gift she cannot refuse to use when asked -- but a gift she has to keep hidden lest she gain some unwanted attention. From an Irish Catholic family, she lives in the heavily Quaker town of Hopewell, a well-liked healer and farmer's daughter. First of all, Goddess Born is historical fiction, which is my favorite genre. There's just something about going back in time and reading about people living in simpler times, that draws me in. I love picturing the characters in the past. Historical fiction novels always feel deeper and more nuanced to me. I love that. Well, not only was Goddess Born historical fiction, it Goddess Born was such a surprisingly awesome read! I loved everything about this book, and found myself sad when it was over. Oh, semi-Gothic novel, how I’ve missed you. I cut my romance teeth on the classics in Gothic novels – Bronte, Woodiwiss and the indomitable Victoria Holt. GODDESS BORN isn’t quite in those categories, but delightfully close enough. The fact that there’s a Celtic goddess in there is just icing on the cake. I should say, though, that all Gothic aside, this one is firmly in the PG zone and all bodices stay firmly unripped. That said, I truly loved GODDESS BORN and spent most of tonight reading the last 2/3 of it in one sitting. I couldn’t put it down both for the mystery of the story and because I wanted more, so much more, of Selah and Henry and quite possibly another trip into the Otherworld to see Brigid (Celtic gods and goddesses are a huge weakness of mine.) The world was an amazing one and one I’d love to revisit. Selah was a delightful character – very strong in her own right and doing what she has to do to save her life and livelihood and I admired her for her devotion to her gift, and the land she’s lived on her whole life. I felt for her struggles to do what’s right to keep the laws that govern her life, even in the face of losing what’s most dear to her. Henry is a joy in both his resolve at first and the slow cracks that start to show even as he sets the conditions for their marriage. The supporting characters really flesh the story out well. Nora was my favorite, but Ben and his “defensive farming” comes in a very close second. Goddess Born had a nice mixture of historical fiction as well as supernatural and societal themes. The main character, Selah, is a direct descendant of the Celtic goddess Brigid and has the power to heal. Not to mention.... when her betrothed dies at sea, and a threat is made for her hand in marriage in exchange to kee 3.5 stars!! Not to mention.... when her betrothed dies at sea, and a threat is made for her hand in marriage in exchange to keep her magic a secret, what will she do? And when the evil she had thought turns out not to be, what will her fate be? My thoughts: Goddess Born was a refreshing spin on the 1700's when women were often looked as subservient than men and married off and looked at as mere property. It was nice to see the divide in this instance with Selah as she does not fall into that norm (in fact, she rejects it). And on top of that, battles with the secret of keeping her gift a secret in check while trying to live her life and helping people in need. The author Kari Edgren does interweave a nice amount twists and turns into the plot as I did not know what to expect in the end. I'm not saying that everything was perfect though, it did have some instances of predictability but I did enjoy the story as a while nonetheless. So over all, a very original, creative, and refreshing read!! Goddess Born is a historical romance with paranormal elements. It's a glimpse into what life was like for women in the years before the birth of our country, back when we were still colonies of England. Though Selah is an eighteen-year-old woman, she has very limited rights once her father dies. Selah must decide whether to marry a man she despises or risk losing everything, including her life. Selah is a descendant of a Celtic goddess with amazing healing abilities. Living in the Quaker community with her human father, Selah risks her life every time she uses her power. However, she is bound by a sacred duty to help those in need, even if those people might accuse her of witchcraft. Selah is an impressive character. Perhaps it was her demigoddess status that made her stronger than the average woman of the era. Selah is also quick witted and intelligent. I really liked her. I loved the idea that Selah was unable to deny healing to anyone who asked, even if it was to her own detriment. Combine that with the fact that she had to keep her powers a secret out of necessity, and that made for some very interesting situations. I also thoroughly enjoyed the tangled web that Selah wove when she first thought up the deception of having Henry pose as Samuel. Henry wasn't some pushover, and he wasn't always on board with keeping up the pretense of being someone that he wasn't. When I started this story, though, I didn't realize that this was a "sweet" or New Adult romance, and I admit, I was a bit disappointed that the strong chemistry between Selah and her new husband was never actually consummated. I was also very disappointed that while we got hints as to Selah and Henry's future in England, we never really got a full-on Happily Ever After for them. I'm not sure as to whether this is because the story was intentionally left open for a sequel, or if the author felt that the ending was sufficient, but either way, it left the ending far to vague for my tastes. Despite these things, I still enjoyed this story, though the open-ended way that it closed did bring down my enjoyment as I turned to the last page. In the end though, this was an entertaining way to pass an evening, and recommended for fans of magic, false marriage, and good chemistry. An enjoyable, sweet read, Goddess Born was a lovely historical romance, with a sprinkle of magic. It wasn't perfect, but I did like it. Overall, it was a good read. Selah was a good heroine. She was resilient, and determined to escape a fate that others would force on her. She wasn't the most memorable heroine, but I liked her fine. Henry was the replacement husband and I thought he was wonderful. I wish we had gotten to see more of him, because he was oddly sparse for the first half of the plot a An enjoyable, sweet read, Goddess Born was a lovely historical romance, with a sprinkle of magic. It wasn't perfect, but I did like it. Overall, it was a good read. Henry was the replacement husband and I thought he was wonderful. I wish we had gotten to see more of him, because he was oddly sparse for the first half of the plot and only a little more present for the second half. But, from what I saw, he was sweet and I liked him. The romance was good. It took a while to start up and even longer for them to finally admit their feelings. But, despite that annoyance, I still thought they were sweet together. And, this one was a clean romance. The plot was okay. It was slow going at first. I was only mildly interested for the first half of the book, but I got more engaged in the latter half. Overall, I enjoyed the story and I thought the ending was lovely. Goddess Born was a good historical/paranormal romance. It had its flaws, but it was an overall enjoyable read. I wouldn't outright recommend this book, but it is worth looking up. We generally associate Puritans with colonial witch hysteria, not Quakers. Since Quakers are supposed to be non-violent and officially did not believe in witchcraft, it’s hard to imagine that the lodging of a formal accusation of witchcraft would have arisen in Pennsylvania during that time period. This has been a year in which I’ve discovered books dealing with historical Quakers engaging in activities that are against Quaker principles. Now Kari Edgren has asked me to contemplate 18th century We generally associate Puritans with colonial witch hysteria, not Quakers. Since Quakers are supposed to be non-violent and officially did not believe in witchcraft, it’s hard to imagine that the lodging of a formal accusation of witchcraft would have arisen in Pennsylvania during that time period. This has been a year in which I’ve discovered books dealing with historical Quakers engaging in activities that are against Quaker principles. Now Kari Edgren has asked me to contemplate 18th century Quakers persecuting a young woman who had benefited many members of her community. Do I think it’s believable? Based on the history I've been reading, I unfortunately do find this novel credible. Goddess Born contains some predictable elements that are due to its being a romance. Romance readers will want to know whether it adheres to the rule that every romance must end with HEA. I have to tell them that it isn’t quite HEA. Goddess Born ends with the chance of HEA which could be setting up for a sequel. A sequel would justify a delayed HEA. I found the ending a satisfying one. If you are a fan of Diana Gabaldon's Outlander series, then you will like this book. Don't get me wrong though. There isn't any time travel and it's not set in England nor Scotland. However, as I was reading, I was struck by how much Selah Kilbrid was like Claire from that series. Selah, like Claire, is a healer and is also thrown into a precarious situation that she is highly unsure of how she will extricate herself. And there is where the similarities end. For Selah has a secret. She is Goddes If you are a fan of Diana Gabaldon's Outlander series, then you will like this book. Don't get me wrong though. There isn't any time travel and it's not set in England nor Scotland. However, as I was reading, I was struck by how much Selah Kilbrid was like Claire from that series. Selah, like Claire, is a healer and is also thrown into a precarious situation that she is highly unsure of how she will extricate herself. And there is where the similarities end. For Selah has a secret. She is Goddess born, a woman with the power to heal with her touch. And given the time she is living, it is indeed a dangerous power to possess. The threat of being accused a witch is around every corner. Positively brilliant is what comes to mind when I think about Goddess Born. It was a riveting story that had me captivated from chapter one. The sheer amount of twists had me eagerly turning pages and my emotions on high alert. Kari Edgren has created a masterpiece with this one. The story was beautifully written and the character development was astounding. I truly haven’t enjoyed a book this much in a long time. Edgren is an author to stalk for future works of pure art. I wait on baited breath Positively brilliant is what comes to mind when I think about Goddess Born. It was a riveting story that had me captivated from chapter one. The sheer amount of twists had me eagerly turning pages and my emotions on high alert. Kari Edgren has created a masterpiece with this one. I wait on baited breath for news that Henry and Selah will get another book. These characters have embedded themselves into my being and I simply must have more. This is a story that I not only recommend but urge you to read….now…go one-click. GREAT plot!!! Loved this book! Set in the late 1600's in Pennsylvania this book had it all...witchcraft, romance, and mystery! Selah Kilbrid comes from a long line of "healers". Her grandmother and mother had both meet an early death...now attempts are being made on Selah's life. Why is this happening?! Now that Selah's father has dies all she has left is the staff from her families estate, Brighmor. Can she trust all of them with her secrets?! I loved the ending! Left the reader hanging a little bit and definitely wanting to know what will happen to Selah next! I give this one 4.5 stars! Goddess born is a magical historical romance. I was very pleasantly surprised by this book and I absolutely adored it. It combined the mass hysteria of the witch trials of the 1700′s with Celtic mythology to make one of the most engaging books I have read this year. Selah is such a wonderful character with ethereal qualities. She is almost guileless and innocent of heart and never deserved being so persecuted. The goddess born is a stunning début that is unforgettable. I really hope there are more books to come because Kari Edgren created a beautiful story set in a enchanting world. My only complaint about this book- is that it ended when I wanted more. This was a lovely read that kept my interest throughout the story. It is a rare find that keeps the paranormal, normal. It doesn't go off the deep end into craziness, but keeps to the aspects of the paranormal and fits it into society and everyday life of the characters. The meticulous plot played out well with good tempo, twists, and neat ends. There was good suspense and a great romance with the main characters that was both believable and oh so sweet. This book was well written and satisfying This was a lovely read that kept my interest throughout the story. It is a rare find that keeps the paranormal, normal. It doesn't go off the deep end into craziness, but keeps to the aspects of the paranormal and fits it into society and everyday life of the characters. The meticulous plot played out well with good tempo, twists, and neat ends. There was good suspense and a great romance with the main characters that was both believable and oh so sweet. This book was well written and satisfying and kept me up all night.